Pressure Cooker Delivers Ham and Beans in Minutes! Gotta Love That Pressure Cooker! tablespoons of Shirley J’s Slow Cooker Pork Seasoning in my pressure cooker. I stabilized the pressure at high heat for about 30 minutes while embarking on a kitchen cleaning frenzy. As I was doing so I spied about 3 cups of pinto beans that I had purchased in the bulk foods section of Winco which I had forgotten to seal in a Mason jar. So I decided that ham and beans sounded like a good option for dinner before I dried my beans out too much. 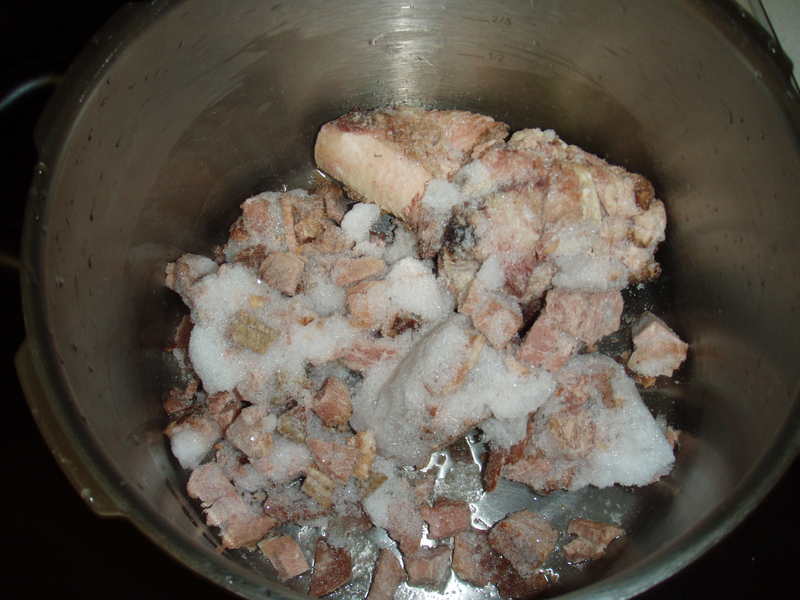 All I did was rinse the beans off and then added them to the pressure cooker with the ham bone. Thanks to a pressure cooker, by 5:30 p.m. my husband and I were enjoying a very tasty ham and beans meal with only these three ingredients. Pretty impressive when you consider that most dishes of this nature call for soaking the beans overnight and slow cooking the entire meal most of the day. Instead, we enjoyed a convenient, comfortable meal with all of the nutrients intact. I like having a meal in a jiffy without nuking it or compromising the texture and taste. And thanks to this invaluable technology, I got every drop of bone marrow from my ham bone. Yum-Mee! Now some of you may be surprised that I didn’t have to soak the beans or simmer the ham and beans for hours. But that’s simply one of the great things about having a pressure cooker. I easily use my pressure cookers every week to make meals that would usually take an exorbitant amount of time. Whole grain white or brown rice only takes 10 minutes on high pressure—and turns out perfectly every time. Irish cut oats, wheat berries, any type of grain or legumes turn out wonderful with a minimal amount of effort. Even better, when I use a pressure cooker, I don’t have to heat up my house by cooking all day AND I am able to continue cooking on high heat even though I have my stove top turned all the way down to the lowest setting. From a preparedness standpoint, this is especially handy in the event that you have to live off of a limited supply of precious fuel such as propane, butane, or kerosene. So, for this weeks article to aid you in using your long-term pantry items, I hope that I’ve sufficiently encouraged you to check out this marvelous tool of everyday preparedness. If you already have a pressure cooker, I hope you won’t hesitate to constantly try new things and see just how much of a great impact it can have on your busy schedule and sophisticated palate. I have a pressure canner/cooker from the 1950s that I've only used for canning. It does a brillant job with my canning. I have the instruction manual and it does give info on how to use it as a pressure cooker. From what I have read, modern pressure canners and cookers are not interchangeable. Do I dare try cooking in my vintage canner? You can cook in a canner but you can't can in a cooker. So long as you remember that rule, you'll be fine. Kuhn Rikon, 5 qt. to start. (aka Duromatic) I'd look on the internet first. You can also find them at any Bosch Kitchen store. 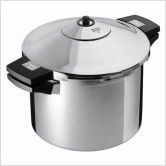 Perfect pressure cooker, no fear, and keeps food warm after it has cooked. I have 4 and 6 quart. Kellene, I just bought one and can't wait to get started. Your blog is great! just a thought...not about pressure cookers, tho. the other morning we went out and found all four of our cars had the gas tank flaps open. We thought that someone had been siphoning our gas! but we found that someone thought it would be funny to flip open the gas tank flaps on every car in the neighborhoord. This made me think. with the cost of gas and the mentality of some people, I wonder if it sounds paranoid to get a lock for our gas tanks? my husband thinks it is nuts, but all it takes is someone to pour some junk into your tank or to siphon your gas and you are on foot for a while. What do you think? Locks on gas tanks were widely practiced during the fuel crisis of the 80's and the 50's. I don't think it's a paranoid idea at all! Then again, I believe in keeping my car in a garage too--but that's not to say it's not exposed when you're at a grocery store, etc. Nope, I didn't boil them. I did put them in hot water in a bowl while the ham hock was cooking in order to get them rinsed off, but that was it. I don't know what it is, but when I cook them in the pressure cooker, I don't have digestive problems. I'll have to figure out the science behind that one. Practice all new food types. I do like beans and until your body gets used to it you will have a "Toot" issue. Same thing with fresh vegies or whole grains. Work them slowly into your diet. It shows how far we have moved from whole foods when whole wheat can reak havok on your system. Well live and learn, mix flours 1/2 whole wheat and 1/2 white flour, until you get get your body used to whole grains again. I just got this cooker and have no recipe book. Do I add any water? How do you know when you are experimenting with things how long to do items? I look up recipe books and instruction manuals online. Lorna Sass is my favorite pressure cooker cookbook author. And her instructions are explicit. After doing things a few times, you'll get the hang of it and be able to just wing it on many dishes.